The new Georgia Standards of Excellence were approved effective for the 2016-2017 school year. The Center provides programs featuring Georgia's Native Americans that will supplement classroom curriculum. Many of the revised social studies and science standards are incorporated into the tours according to grade levels. Major changes in social studies standards appear in third grade curriculum. Previously, students studied the Southeastern Indians in the fourth and second grades. Now they will study Georgia’s Cherokee and Creek Indians in the third and second grades. A new tour has been designed to meet curriculum needs for the fourth grade students. It will include information about western expansion and the Trail of Tears. In addition, students will visit the Sellars Tool Gallery to study simple tools as part of this tour. Weather permitting, History Alive programs in the Appalachian Settlement add an unique and fun addition to the indoor museum tours. Many of the Center's docents and living history volunteers who participate in all programs are retired teachers. 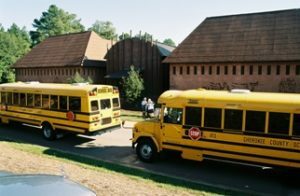 Since its opening in 1999, FHC has been dedicated to sharing Georgia’s history through the exhibits and special programs for students of all ages to make history interesting. The school trips provide a high level of learning and engagement. There is always something exciting and fun to learn during school field trips. To assist teachers and parents, we have provided a link to the Georgia Department of Education website. You may locate the social studies and science standards for each grade by clicking on http://public.doe.k12.ga.us/ To make a reservation for a school group, call 770-720-5967 and a representative will work with you to customize your tour. Fees for 1 hour school tours range from $6 to $9 depending on the tour selected and any additional programs added. Advanced Registration is required for all school group tours. The Funk Heritage Center has been designated by the Georgia Legislature as Georgia’s Official Frontier and Southeastern Indian Interpretive Center. Students learn about the Southeastern Indians and the early European Settlers of the Appalachian foothills. Teachers are welcome to add a museum gift shop visit to the tour. Minimum group tour size is 20 students. Also, weather permitting, visits to the Appalachian Settlement may be added to all museum tours. See the History Alive page to learn more about this option. For students K - 3, teachers may want to consider including a 15 minute Pioneer Music program. Children enjoy singing along with our pioneer lady while she talks about a variety of instruments used by pioneers. This indoor program is also available during winter months. If you are interested in adding this option to a museum tour, mention this to our reservation specialist when making your reservations for a tour. Click on the above "Group Tours of the Bennett History Museum" page to see tours specific to grade levels. Tours for groups of children from child care facilities are offered during the summer. 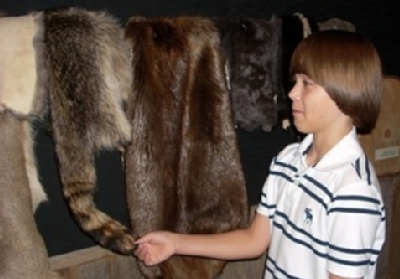 Tours are similar to school tours and children can go to the Appalachian Settlement, weather permitting. This tour includes a craft ($1 craft fee is added to tour fee) and the minimum group size is 15 children. This popular living history event is held in the Appalachian Settlement in each year in October. Professional history interpreters present brief programs, and students will visit the pioneer village. Teachers are encouraged to make reservations early in order to schedule the best day and time for their school. This event is reserved for school groups. This annual May event is is a two-hour program for grades K-5. It is held in the Appalachian Settlement and features living history volunteers dressed in period clothing. Children visit log cabins, the blacksmith shop, the sorghum syrup mill and observe settlers demonstrating crafts. Children also enjoy pioneer games and period music. This outdoor event does not include a tour of the Bennett History Museum. I thought the field trip was awesome. * My favorite part was the movie. * I learned that Indians were alive in 1,000 BC and they used spears and bow and arrows to hunt animals for food. * The indians wore deer skins, beaver skins, skunk skins and squirrel skins and we got to feel them too. * I loved all the tours but I especially liked the tool room. * My favorite part was the weapons, they were cool and our guide was awesome. * It was the best field trip since Pre-K. * This was the first time I ever touched a deer skin. * We saw this really big, cool rock with writing on it. It amazed me. * I liked the tool room because we saw over 2,000 tools in this room. This was a cool trip!